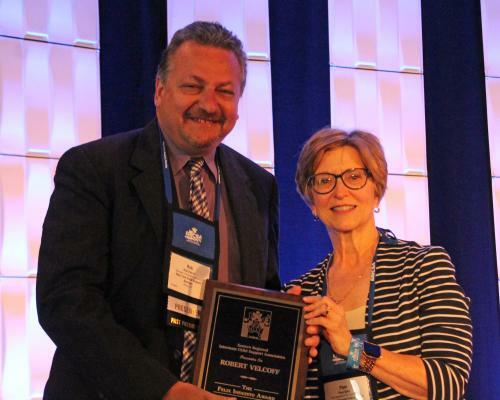 Rob Velcoff, an ERICSA past-president and a leader in the child support community, received the 2018 Felix Infausto Award. The Felix Infausto Award is the highest honor given by ERICSA. It is presented annually to a member who represents the highest level of leadership and contribution to ERICSA. Rob has worked for the New York State Division of Child Support Services for almost 29 years. He became Manager of Interstate Operations in early 1999, and supervised the Central Registry until November, 2008. He was involved in the implementation of UIFSA in 1996 and the newer version in 2008. His knowledge in intergovernmental matters is well-known and he is asked to serve on committees and workgroups related to proposed changes. He has been honored by groups in Indiana, Florida, Pennsylvania, and New York State for the assistance he provides to improve intergovernmental services and to assist other states and jurisdictions. “Rob is always one of the first board members to welcome new members to the group and help them get acclimated. He speaks at intergovernmental workshops around the country and has helped numerous intergovernmental workers by answering questions and offering suggestions. Rob is always willing to be the Session Coordinator for the intergovernmental track at ERICSA’s conference, and spends countless hours preparing the questions & answers for the plenary game session on Thursday of the conference. Felix Infausto was truly one of the founding fathers of URESA, the predecessor legislation to UIFSA. A man of vision and legal acumen, he served as advisor to the committee that drafted the original URESA statute as well as the Uniform Support of Dependents Law. In 1968 he originated the definition for the term "State" in the URESA statute which established international reciprocity between the United States and certain foreign countries in child support. Mr. Infausto was born in Buffalo, NY in 1909 and died in 1992. He graduated from the Buffalo School of Law in 1932. In private practice until 1943, Mr. Infausto then began his 32 years of dedication to child support as legal counsel for the New York Department of Social Services. In 1952, during the early years of child support conference formation, he was responsible for the Council of State Government hosting annual conferences regarding the development and expansion of URESA. Most notably, he chaired the Family Law Section of the American Bar Association and was a life member Public Welfare Attorney’s Association, the American Judicature Society, the Inter-American Bar Association and both the National and Child Support Conferences. In 1970, he co-authored with W.J. Brockelbank, "Interstate Enforcement of Family Support" (2nd Edition) which is considered by child support professionals to be the authoritative reference for interstate and international child support. This book answered the crucial legal question in the late sixties and early seventies - "Did the law have meaning if thousands of families and children were left destitute and dependent, even though the obligor had the ability to pay and was in another state?". In 1969, Mr. Infausto was the first President of the Northeast Regional Conference on URESA, which in 1971 evolved into the Eastern Regional Conference which is presently ERICSA. Throughout his vibrant and prodigious career he maintained a number of prestigious affiliations and was appointed by the United States Secretary of State to attend the Conference on Private International Law at The Hague on Family Support. The first recipient of the ERICSA Recognition Award in 1983, he and his lovely wife Claire continued for many years to attend this conference despite the obstacles of his physical handicap. It is truly in the spirit of Felix Infausto that this annual award is presented to a valued member of ERICSA who has demonstrated the highest quality of outstanding leadership and contributions to this organization. 1992 -- Gordon F. Bailey, Jr.
1986 -- Judge Joseph M.F. Ryan, Jr.